In a previous post we talked about the differences between Tags and other ticket fields. To recap, imagine you have only one ticket with four tags and a First Reply Time of one hour. If we want to slice the First Reply Time by one of the tags, we find that we cannot do so. The reason is that GoodData has no way to slice the one hour First Reply into the four different tags of the ticket. Rather, the first reply is tied to the Ticket, not to any individual tag. What we need to in this case is filter not on a specific Tag, but rather filter for Tickets which contain a certain tag. First, we need to create a custom metric to show tags with our tag "customer." This new metric will not be displayed in our report, but instead will be used to filter our results so we only see tickets containing our "customer" tag. This filter means we are filtering our results to only contain Ticket IDs which contain the "customer" tag. To review, the proper interpretation of this report is that we are pulling the median First Reply Time of tickets with the "customer" tag that are assigned to these ticket groups. 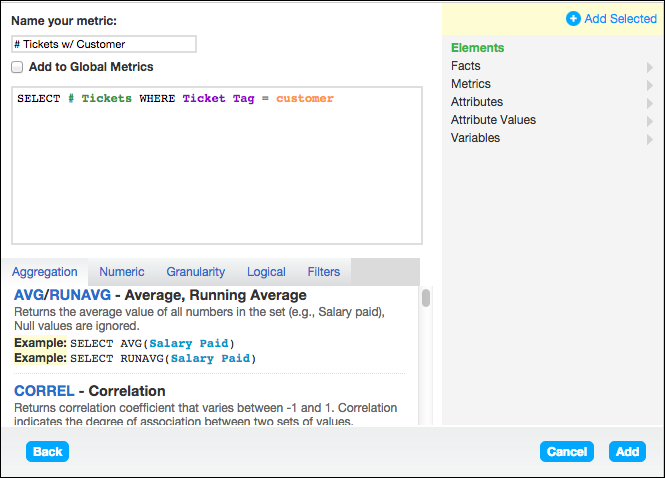 For more information and examples using the tag metric, see Filtering reports by tag. 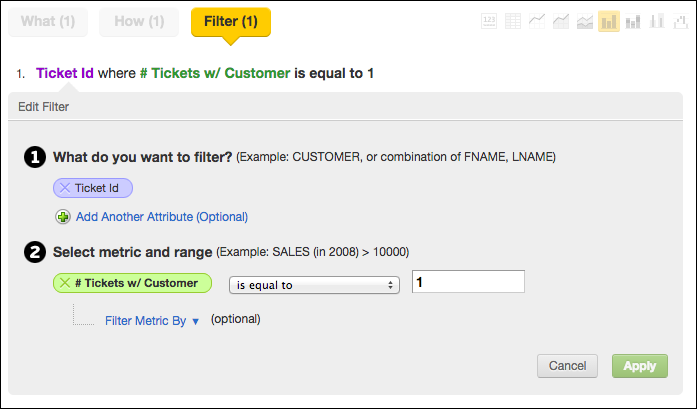 Try slicing by the ticket tag attribute and then use a filter to limit the tags to the ones you want to display. But, when i tried to combine with another how in this case with Full time resolution, the report can not rendering. Hi Eryk, I'm going to follow up with you in a ticket to see what's going wrong. I'll see you there! I have a question since I spent some time on the tool without managing to get the report i needed. I created the below report, and is not complete. Along with the tag and the # tickets I would like to add the FULL Resolution Time of the tickets belonging to each tag. However, whenever trying to add the Full Resolution Time to the What list, the report breaks. Am I missing something in the logic I am using? Since we use around 200 tags as we support many different products, it's extremely necessary to be able to count the mdn resolution time per tag, and is unscalable to create a custom metric for each of the tags we have. @Francesco, did you ever find a solution to reporting the resolution time based on tags, without having to specify the tag in the metric? I've been struggling with this issue and so far I haven't been able to find a scalable solution.